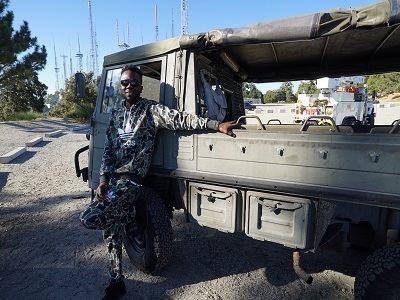 45DiBoss Releases First Studio Album - Dancehall singjay 45DiBoss has high hopes for his recently released album, “Love, Power and Sound Mind. Making its way to all major digital steaming sites on October 20, 2017 through Dise Records, 45DiBoss explains that the album is a major part of his career. "My passion for music stems for the belief that I will gain eternal life through the power of my music. I want my voice to sing out way after I'm gone, I want to deliver messages of peace and love through catchy hooks and unique styles while blurring the line of music genres. I don't care about genre class, I care about how the song makes me feel. This album goes against all the odds and my fans are loving it" 45DiBoss explains. Produced by DJ NA from the group NGUZUNGUZU out of Los Angeles, California, the album boasts a total of twelve tracks which include: ‘Sugar Cain’, ‘Day One’, ‘Block Call’, ‘Guh Deh Gyal’ ft Ice Kydd, ‘Call Worldfeet’, ‘From Mi Heart’, ‘Eva Bless’, ‘Hot Peppa’, ‘100 Knots’ Ft Tashi, ‘Air Inna Mi Lungs’, ‘Big Deal’ and ‘Hands Of Time’ ft Tashi. “The album has been doing great so far, Guh Deh Gyal ft Ice Kydd has been receiving airplay in Jamaica and the USA, it also peaked at number 5 on the Suncity Radio music charts and I have to thank my supporters for the massive push. In addition, Blacka Di Danca, Zaggazo and Las Bigga made a video dancing to Hot Peppa and it was featured on Red Bull Energy Drink Instagram page, it received over 250,000 views” He said. With the attention the album has been receiving, 45DiBoss released the visuals behind ‘Sugar Cain’ on October 31, 2017. The video was shot on location in La Canada Flintridge, California and directed by Deme Marie and Gavin Burnett. Among his other releases are; ‘Kick Start’ and ‘Christmas In Jamaica’.